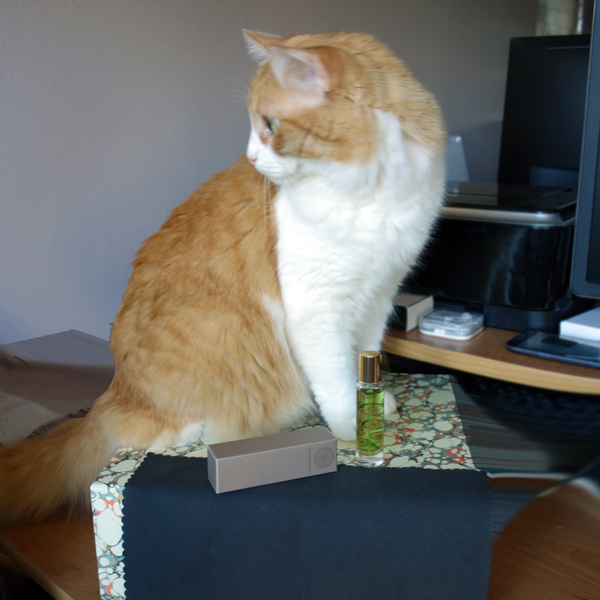 This entry was posted in "Four legs good", Know-How and tagged 4160 Tuesdays, Aedes de Venustas, Amouage, April Aromatics, Atelier Cologne, By Kilian, Byredo, COGNOSCENTI, Dame Perfumery, DSH Perfumes, EnVoyage Perfumes, Frederic Malle, Hermès, Hiram Green, Histoires de Parfums, Ineke, Jul et Mad, Juliette Has A Gun, Le Labo, Maison Francis Kurkdjian, Miller Harris, Neela Vermeire Creations, Ormonde Jayne, perfumista size bottle, Puredistance, Roja Dove, Sonoma Scent Studio, Tauer Perfumes, The Different Company, Viktoria Minya. Bookmark the permalink. Thank you, Esperessence. Being easier recognizable is a great point! I missed it. You’re right: it gets harder and harder to tell apart my decants. I spend 2-3 minutes going through them to find the one I want to wear. Rusty is enjoying my blogging: while I respond to comments, he sits on my lap. thank you for the list!!! I will definitely be looking into some of these. I agree….we need smaller bottles! Jo Malone has 9ml bottles but they don’t sell them individually (they are usually GWP or in a pack of five where you can’t choose which fragrance you want). I really wish they would offer a customized 2-3 pack the way Hermes does. Pacifica also sells customized packs- Three 1oz bottles for fifty dollars which is not a bad price. and I hope that Dame Perfumery will eventually come out with smaller bottles -15ml would be nice as well as customized sets. Are you reading this Jeffrey Dame? Pacifica has smaller individual rollerballs as well but I didn’t include them because I don’t think about them as a niche brand. I’m surprised JM doesn’t do yet either customizable sets or limited edition sets. I’m sure they would have sold a lot of those. Oh and the shipping is free no matter what size of the bottle or dollar amount…which is another great thing! I feel a fool for never looking to see if a brand does travel sizes. I had no idea April Aromatics did them but now I can order a travel spray of Precious Woods right away. It also prompted me to check Zoologist as Civet is another one on my To Buy list and yes, they do individual 11ml travel bottles (as well as travel sets) so I can pull the trigger on that too! Happy day. Many thanks. 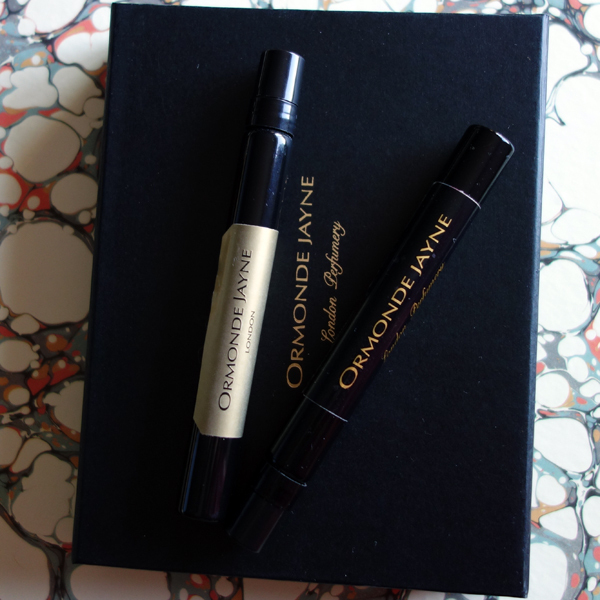 Ormonde jayne will sell their travel sprays separately but you have to phone them. I didn’t know that, it’s good to know. Thank you, Mary E.
We’re getting so much great knowledge here! Now, when we know not to trust Travalos too much, travel bottles option become especially appealing. I agree Undina. I could be pickled with all the ounces of perfume I own. It’s hard being frugal though. I’m always figuring how much more per oz it is for a smaller bottle, however, recognize the packaging is a cost in itself. Zoologist has very cute smaller sizes of their perfumes, also. I need to check out some of the ones listed above. Have a great day! For a while price per ml bothered me but then I looked at it from another angle: unless you plan and is able to use the extra ml for splits or friendly swaps, you’re paying the same price per ml you’ll actually use up from a bigger bottle before it turns. Great list – thank you! I love the smaller size bottles too. Slip them into purse or suitcase. And they make lovely gifts paired with something else incase the recipient doesn’t care so much. And sometimes one just gets tired of the fragrance! It’s interesting so many folks enjoy this! Perfume houses- take note! Some mainstream brands caught up with that demand: you can see a lot of small size “travel” bottles in Nordstrom and Sephora. They figured out that $25-$35 for a 10 ml bottle is a great deal (for them) for the perfume that sells for $120/ 50ml or $165/100 ml. I realize that producing extra sizes requires additional investments. But I hope that it’ll have economical sense for at least some successful niche brands. I couldn’t agree more, Undina. I can add Olfactive Studio to the list, 10ml travel sizes in a box. Then there is Frau Tonis Berlin, and MDCI in 10 ml splash bottles, the latter has to be bought in a set of 4 or 5, can’t remember, but you can chose your own selection. For Paris visitors, PG do have 30ml bottles in their own brand shop there. I checked Olfactive Studio’s site and didn’t see travel set for either U.S. or U.K. e-Store. The french one has a set of 4 ml bottles but that is rather sample set then travel bottles. I’m adding information about MDCI (thank you!). 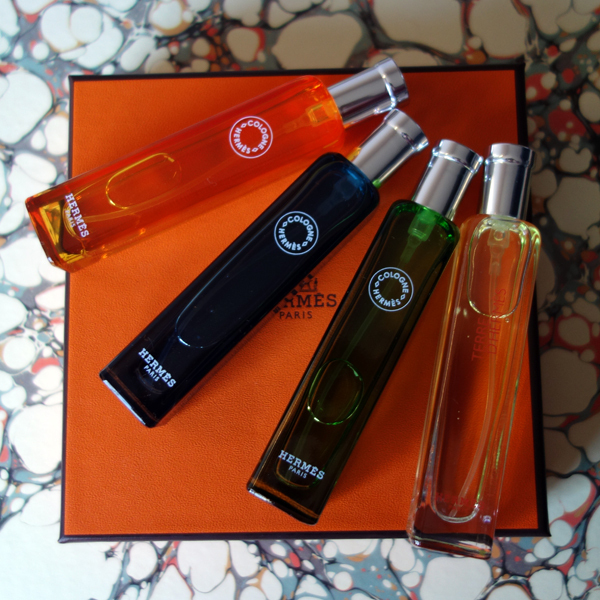 As to 30 ml bottles – those are good, much better than 100 ml or even 50 ml, but still too large for a perfumista collection. I weren’t including those brands that make 30 ml bottles, though I’m thankful to those brands as well. Memo does 10ml bottles. Jolie Laide sells in 15ml bottles to begin. 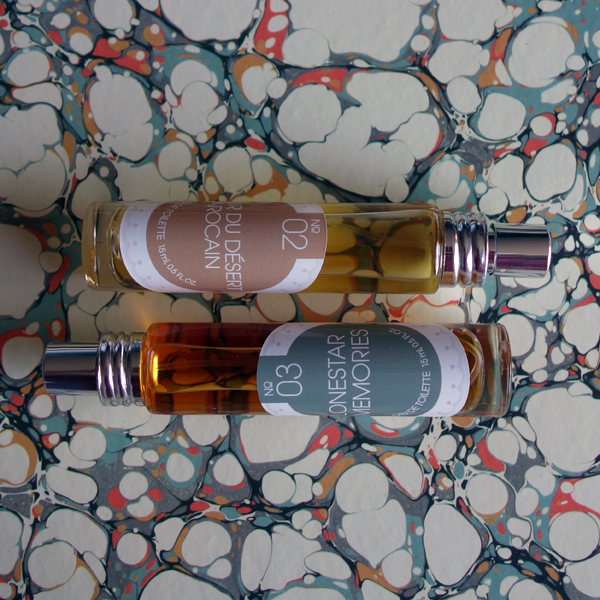 Parfums Mendo does rollerballs in a small size, as does Olo and Solstice Scents. I’ve added Memo. As to the rest, I purposefully didn’t include oils and attars, as well as extraits: even though those do come in small bottles, it’s not the same as 10-15 ml bottle of perfume that normally would be sold in 50-100 ml bottle. Serge Lutens Tout Noir limited edition 30 ml of the same perfume. Guerlain La Toutte Parfunee 20 ml travel spray in a limited number of scenrs. Rusty just missed my set of “loose” perfume bottles (he would have had a field day with those), so he came to see what I was doing with that Ashoka bottle. But he started loosing his interest quickly – so I hurried to take at least some pictures. I can’t add SL: I wasn’t covering those brands that do more than 20 ml (and I wouldn’t have added Jul et Mad with their 20 ml either if it weren’t for their 5 ml Love Dose). While still minority, there are more companies doing 30 ml bottles. As to Guerlain… I know that those exist :), I know that you have one (or two?) of them but I cannot find any information online about it so I’m not sure how useful it would be for others. Thank you, Nemo! I’ve added Olympic Orchids. I’ve added Soivohle. Any reason why you’re blind buying those 10 ml instead of samples, which are also offered on the site? Hello, this is the first time I post. In South America, or at least in Argentina, Avon has been selling 15 ml bottles of some of their perfumes (the classics and I guess their new best sellers) for almost a year now. I already bought two, which I probably wouldn’t have in their original sizes. Hi Mariana! Welcome to my blog. I’m not sure if I’ve ever tried any of Avon’s perfumes but I know that they have very cute bottles for some of them, and those become collectible items with time. Which ones have you bought? Hi Undina … I used to have an Avon scent that I’d wear to the office … Rare pearls …. I think I may have brought it fir you to try. If I recall, you liked how it smelled in me but it didn’t work at all fir you when you tested it. I remember the bottle! It’s strange how memory suddenly brings up a recollection that you weren’t aware existed. It wasn’t the first time I liked perfume on somebody else but not on me. 4160 does 9 mls? Oh good, have been meaning to try some of theirs. De Nicolai seems to sell .5 oz travel sprays but only in conjunction with big bottles (250 mls) you get the set. Which to my mind defeats the purpose. Will Creed ever downsize bottles? If I’m not mistaken, 4160 has also samples so you don’t have to commit even to 9 ml. Some companies started doing those combinations – a large vat of perfume coupled with a smaller bottle. I assume, they pose it as you’re buying perfume for your everyday use plus getting a smaller (sometimes refillable) bottle to have in your purse for re-application or to take while traveling. But I would rather have a small(er) bottle because if I buy a big bottle of anything, I’ll figure out how to take it on the road with me: e.g., if I’m committing to a huge bottle of any perfume, I’ll be OK to invest into a Travalo or something like that. Profvmum Roma also has smaller sized bottles, 18 ml travel sprays for some of the popular gourmand scents like “Dulcis in Fundo” and Lutens also has travel sizes for Fourreau Noir, De Profundis and Iris Silver Mist, among others. 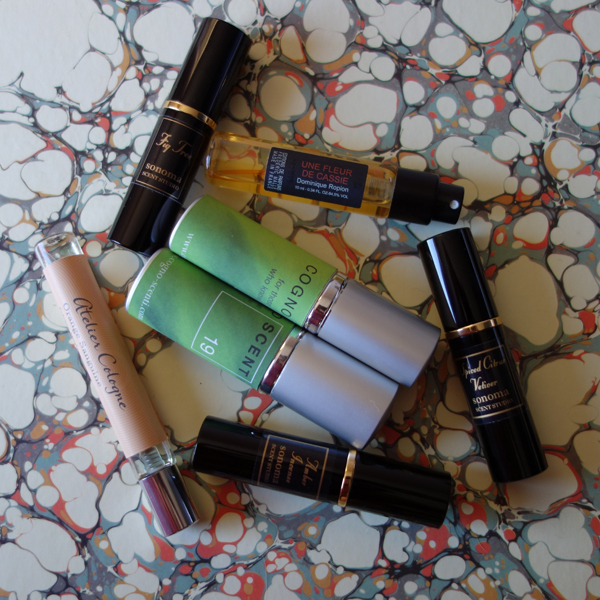 I was especially happy to find the travel sizes for the Lutens that normally come only in the bell bottles. I’ve added Profvmvm Roma, thanks. As to SL, it doesn’t count: those perfumes come as two 30 ml bottles, which is just 15 ml less then a bell jar.